In this guide I will explain how to create and set up a vegetation color mask with the Microsplat terrain shader. Microsplat has a built in module for the vegetation color mask. As an example I will generate a mask from the included demo scene and set up Microsplat with the mask on the terrain. The module is included with the free Microsplat asset on the asset store. 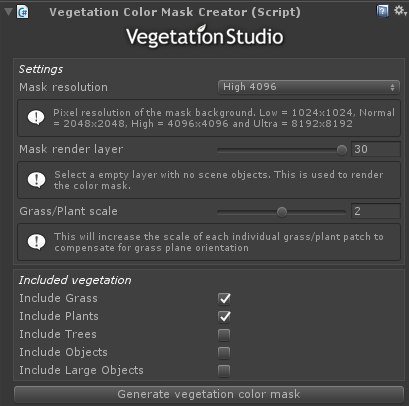 The mask is created using the VegetationColorMaskCreator component. 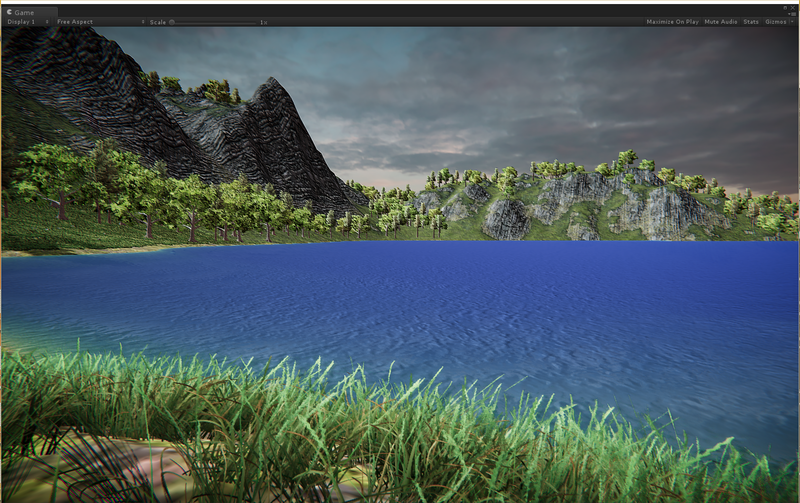 First we load the demo scene included in Vegetation studio. 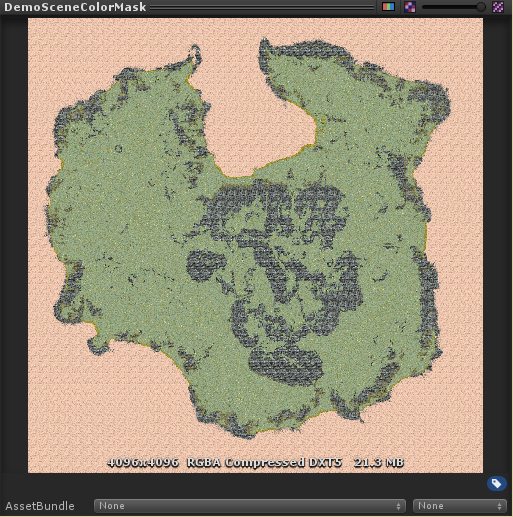 Find the terrain and add the Microsplat Terrain Component. With the component added we need to update the terrain and create all the microsplat materials and texture arrays. Press the Convert to Microsplat button. After some seconds you will get this. If we go back to the Microsplat Terrain component we will see that a GrassMap texture slot has shown up. Now to generate the mask itself. 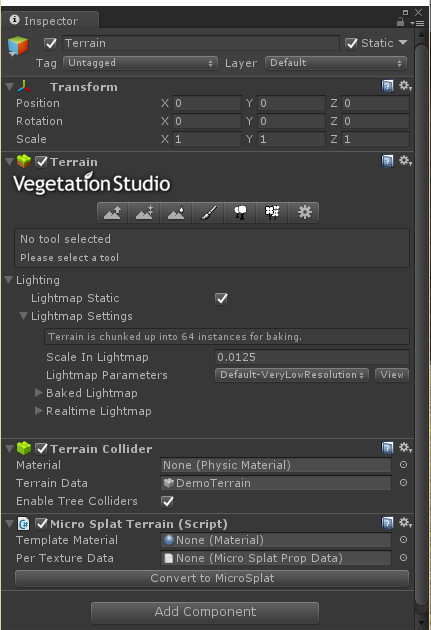 Find the VegetationSystem GameObject in the scene and add a VegetationColorMaskCreator component. The resulting mask will look like this. 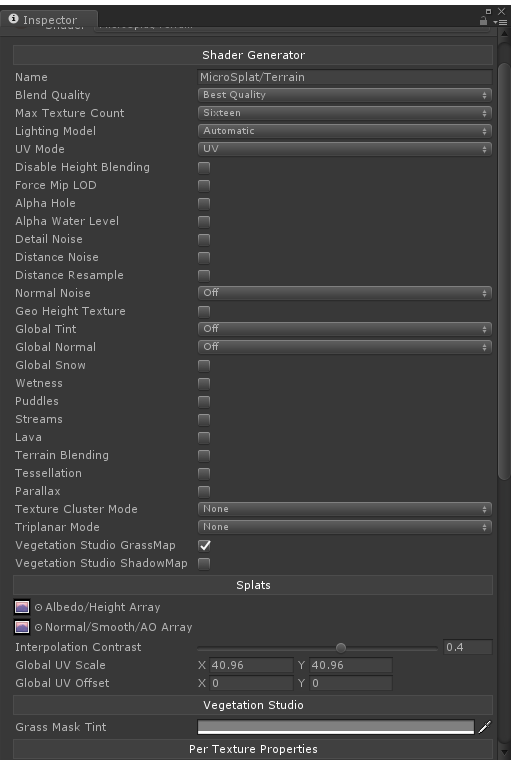 It has an alpha for the non grass areas but this does not show in the unity preview window. Now assign the mask to the empty Grass Map slot on the MicroSplatTerrain component and it is working. Here you see the result of the generated grass mask before and after.